If you've been looking for the perfect trailerable cuddy cabin powerboat, you need look no further. Developed from a traditional offshore New England fishing boat type, Nexus Marine's 23' Chinook has more of what you need. Our new Variable-V hull puts more vee forward where it softens the ride. The flatter stern increases stability. There's no wallowing at lower speeds or pounding on plane. The layout of the 23' Chinook is specially adapted for sportfishing and small boat cruising. The cabin is amazingly roomy and the cockpit is wide and unobstructed. The styling is clean and nautical. When you look at the sophisticated hull design, the sensible layout, the advanced engineering, and the careful custom building, you will see that these are boats to be used and appreciated. We've optimized the 23' Chinook hull for the steep chop common to our waters and for the wide range of speeds necessary for efficient fishing and cruising. Our Variable-V hull has an extremely sharp vee-bottom with a high chine forward that cuts through chop more smoothly than any so-called "deep V." The hull bottom twists into a smooth vee planing surface at the stern. This combination creates efficient performance at high speeds, wander-free tracking at trolling speeds, wonderful stability, and a general lack of rolling. Whether running in inland whitecaps or ocean swells, you get a smooth, controllable ride going upwind or down. We've seen the owner still smiling in a 5' wind chop. This boat doesn't have a "bad speed". 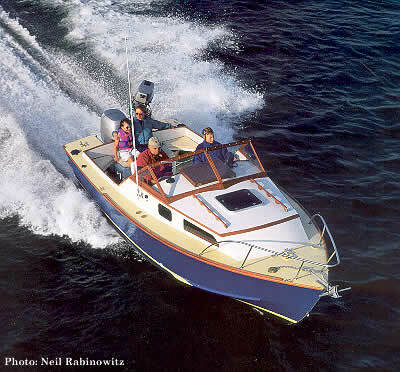 Planing fast or slow, or at displacement speeds, the bow is down, the wake is small and flat, and the handling is good. The 23' Chinook is also very light. Her light weight allows her to have a finer entry. It increases her buoyancy, or ability to rise with the seas. Lighter weight means vastly easier trailering to all those wonderful nearby vacation spots. Starting in the cabin and working your way aft, you'll notice that the cabin smells nice naturally because of our choice of materials, and because it is well ventilated. It looks good because of our careful selection of woods, finishes, and fixtures. You'll find it pleasant to be in a space that is designed with the requirements of normal humans in mind. The V-berths are 6'8" long, convert into a double, and have 4" cushions. The full sitting headroom under the cabin beams measures 4'6". A Porta-potti is the standard head. Aft of the berths is the galley, contained in a pair of cabinets with teak louvered doors. A two-burner alcohol stove and a deep stainless steel sink with fresh water allow you to create a reasonable meal or make coffee. A large hatch, opening ports, and safety glass windows let in plenty of light and air. The teak cockpit can be as simple or as elaborate as you desire. It is completely self-bailing with large scupper valves. There are flush, watertight hatches the length of the sole for complete and easy bilge access. The 53 square foot cockpit is 6'3" wide, 8'5" long, and 27" deep for comfort and safety for the whole family. The helm and passenger's seats are comfortable, padded all-weather chairs which swivel and slide fore-and-aft. You'll have excellent visibility whether you are sitting or standing. You can get under cover with the optional soft top, side curtains, and full cockpit enclosure. Be outside when the weather is nice, and under cover when it's raining. The standard cockpit sole is solid teak planking epoxy-glued to a plywood substrate. Many cockpit seating and storage arrangements are available, including an ice box for your fish or groceries. Back in the stern, the transom-mounted outboard makes it easy to add a trolling motor, which can also have remote controls. The huge splashwell keeps you safe from following seas, isolates the motor from you and your guests, and facilitates boarding over the transom. Up on deck, you'll find ten to twelve inch wide non-skid coated side decks for good access forward. There are teak handrails and toerails for your safety. The deck hardware is plain bronze, chrome bronze, or stainless steel at your option. The cleats and chocks are large and heavily reinforced. Cockpit and cabin trim, sheer guards, and windscreen are all solid teak. Exterior woodwork can be oiled, varnished, or painted, as you desire. We analyze the stresses on our hulls and design their structures using a computer. It has only been feasible to design light wooden structures such as these since the advent of epoxy adhesives and coatings. This modern composite construction boat uses that wonderful lignin bonded, fatigue-free, unidirectional substance known as wood, still the most highly developed engineering material on the planet. The topsides of this boat are sheathed in marine plywood, made in Europe from exotic veneers and modern glues. On the bottom, we go a step further. Using a process known as "cold-molding", we fashion the complex bottom surfaces from layers of strips of this marine plywood, epoxy, and fiberglass cloth. Our skilled workers vacuum-bag the laminate to create a strong, resilient, void-free hull. The cold-molded bottom and sheet plywood topsides are applied over a stringer/frame system of clear, heartwood fir. The whole boat is epoxy glued and epoxy coated on the exterior. These construction methods are normally employed only on the highest quality custom racing boats. Wood/epoxy construction has a much higher strength-to-weight ratio and greater fatigue resistance than fiberglass or metal boatbuilding methods. Cold-molding our hulls also enables us to use this modern hull form, which is simply not possible for builders of metal, sheet, or stitch-and-glue plywood boats. Similar fiberglass boats are more than twice as heavy. The bottom is ½" thick with ¾" x 1½" stringers on 6" centers. The topsides are 3/8" plywood with 7/8" x 1½" stringers on 6" centers. Cabin sides and coamings are ½", deck and cabin top are 3/8". The stem and keel are Honduras mahogany. Chine guards and skeg are oak to resist abrasion and are applied over the glass and epoxy finish. A stainless steel stem band and bow eye are standard. This combination of oak and stainless steel will resist the abrasion of beaching far better than any fiberglass boat could. The 23' Chinook is exceptionally light weight, weighing only 2460 pounds, loaded and ready to go. If you are comparing published "hull weight," the weight of the boat alone is 1990 pounds. Less weight means less power is required to achieve the same speed: 50 HP will drive her 20 mph; 70 HP, 30 mph; 100 HP, over 40 mph. Less power means less fuel consumed. At a cruising speed of 27 mph, the 23' Chinook delivers 4½ miles per gallon. Either this boat is everything you have always wanted in a boat, or it is not. In the first case, you may reserve yours by placing a 10% deposit with us. These boats take several months to build, and we usually have a backlog. So the sooner you act, the more likely you will be to have one for the next boating season. In the second case, we have smaller and larger versions of this design. We also should tell you that our specialty is the design and building of custom boats in glued plywood and cold-molded construction. Tell us what you are looking for. There is a good chance we will be able to satisfy your special needs. A lot of people ask us, "But won't a wooden boat be hard to keep up?" Our answer is, "Not when they're built like this!" Wooden boats used to be a lot of trouble to maintain. We've repaired and refinished lots of them in our shop. We've found that difficult to maintain wooden boats come in two varieties. Some were built by the old-fashioned plank on frame method with all those individual seams and fastenings to maintain. Others were built on production lines by workers who were forced to slap boats together at ever-increasing rates, with quality sacrificed to speed. Our philosophy and construction methods eliminate these problems. Each boat is glued together to make a single watertight structure that cannot leak no matter how many times the boat goes in and out of the water. We believe that the continued existence of wooden boats, and of our shop, depends on complete customer satisfaction, so we don't cut corners. We build each boat methodically and carefully. And since we guarantee our boats, we find it is less expensive to do it right the first time. Our boats are more durable in the long run than either fiberglass or aluminum boats. Every surface in the boat is either a clear finish that's easy to keep up or polyurethane paint over epoxy. The epoxy coating increases the life of the paint film because it is a moisture barrier. It works in two ways. First, water is unable to get to the wood below it and cause the paint to lift or blister. Second, it keeps the boat from picking up weight due to water absorption, and prevents dry rot. With a wooden boat there is no yearly waxing and polishing as with a fiberglass boat. Our polyurethane paint system will outlast gelcoat.